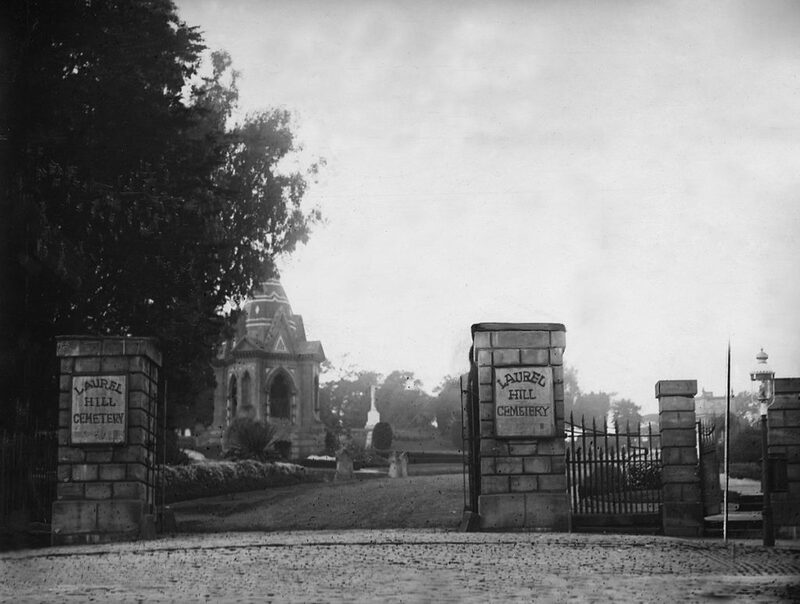 Laurel Hill Cemetery entrance gate and monuments. In 1940, after years of efforts to ban cemeteries in San Francisco, workers began exhuming bodies from the Laurel Hill Cemetery for reinterment outside the city limits. The cemetery occupied a large site bounded by California Street on the north, Presidio and Parker at the east and west and an angled edge along the southern boundary. A landscape of meandering paths and ornate headstones and mausoleums, Laurel Hill was a picturesque, park-like final resting place for the city’s most influential residents. After the cemetery was removed, a large portion of the site was prepared for new housing developed by Heyman Brothers, an established residential developer in the city since the 1890s. Single-family, split-level, wood-frame, stuccoed houses with attached garages and varying architectural ornament popped up quickly in the new neighborhood. Side-by-side duplexes; two, three and four flats; and small-scale apartment buildings rounded out the housing selection. Construction of the intended 600 units, originally conceived of as Mayfair Terrace, was delayed when World War II broke out. The neighborhood eventually became known as Laurel Heights, in homage to the old cemetery, and the accompanying commercial strip along California Street was called Laurel Village. One of the residential streets just south of the shopping center became Mayfair Drive. Buildout of the new residential enclave finally began in 1947 and was about 75 percent complete within two years. A 12-acre section at the northeast corner of the former cemetery remained undeveloped. The San Francisco Unified School District purchased those lots, but ultimately decided not to build on them. A small portion at the northwest intersection of Masonic and Bush became a city firehouse. After much debate and some controversy, the last vestiges of old cemetery lands were rezoned for commercial use and purchased by Fireman’s Fund Insurance for a new corporate campus. Aerial photograph of the newly developed Fireman’s Fund headquarters. SFPL Photos. The Fireman’s Fund was a venerable San Francisco institution that grew into a global presence after World War II. Its first headquarters burned in 1906, but was rebuilt and became a longstanding Financial District landmark, with the firm eventually expanding to multiple downtown buildings. However, evolving business practices and a desire for a more consolidated campus combined to make the Laurel Heights property desirable to the insurance company. It purchased the site from the school district in March 1953. The Fireman’s Fund looked to local Modernist architect Edward B. Page, whose father, Charles R. Page, happened to be the chair of its board of directors. The younger Page had completed several smaller projects for the company, earning the trust of the broader leadership. He assembled a team that included Eckbo, Royston & Williams, landscape architects; Gould & Degenkolb, structural engineers; and Maurice Sands, interior decorator, among others. 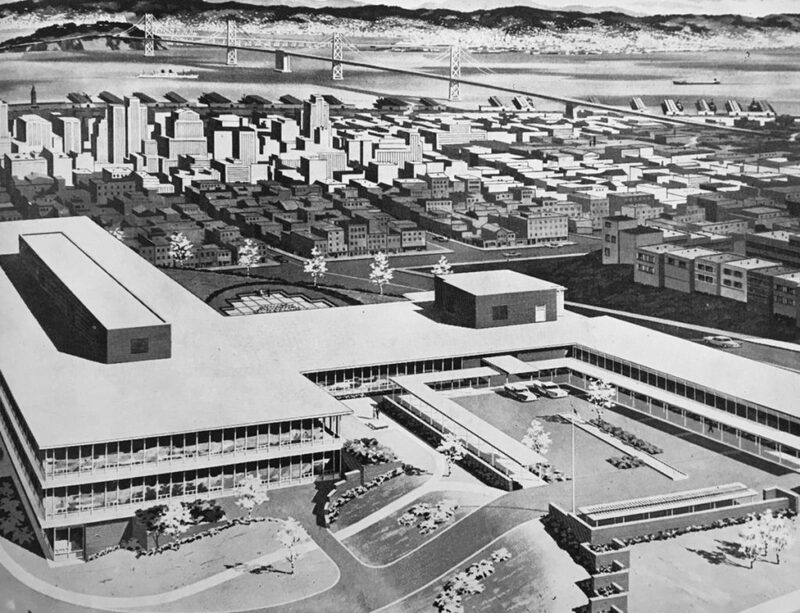 By June 1955, the team submitted plans to the city for review. The main office building, reflecting the International Style, featured large expanses of glass accented by red brick, and was three to seven stories tall. Situated at the site’s center and built into the hillside, with several radiating wings, these design features minimized the presence and scale of the building. Landscaped outdoor areas, including terraces, patios, lawns, planting beds, gardens and arbors, are interspersed among the various wings of the complex. Some mature trees, remnants of the cemetery, were retained in the site plan. Landscaped parking areas were concentrated along California Street, separated by a mid-block entry drive. The red brick detailing of the building spilled into the landscape, with brick used as paving, in low barriers, in planting boxes and at perimeter walls. Corporate America fully embraced the International Style after World War II. The 1932 publication of Henry-Russell Hitchcock and Philip Johnson’s The International Style, detailing their Museum of Modern Art exhibition, had set the stage. The style’s clean lines, limited ornamentation and heavy use of glass appealed to both corporate and industrial designers. It also appealed to the medical industry. 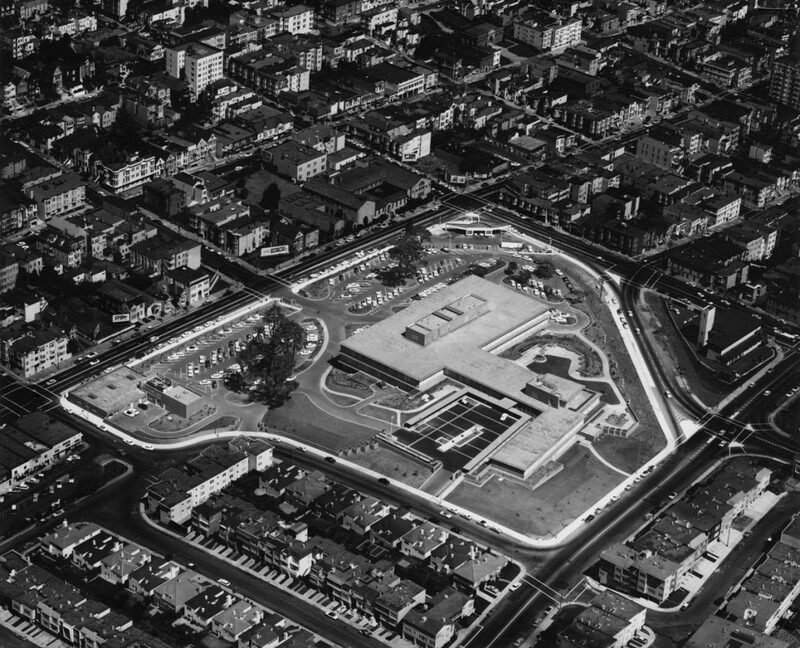 In San Francisco, Erich Mendelsohn’s Maimonides Health Center and Skidmore, Owings & Merrill’s Mount Zion Hospital, both constructed in 1950, were nearby precursors to Page’s Fireman’s Fund campus. Rendering of the Fireman’s Fund complex from Architect & Engineer. The September 1957 edition of Architect & Engineer featured a cover story on the complex, particularly singling out the landscaping: “This includes 110 varieties of trees, plants and ground cover that give the area surrounding the building a park-like aspect.” The French architectural periodical Architecture d’aujourd hui also highlighted Page’s corporate campus. The completed project is by far the architect’s most celebrated work. It also reflects the growing importance of collaborative efforts between architect and landscape architect in large-scale suburban corporate development. However, upon returning to San Francisco, Page worked for three of the city’s most influential Beaux Arts architects — Arthur Brown Jr., John Bakewell Jr. and Lewis Hobart — before starting his own office after World War II. Beginning with small projects and culminating in the Laurel Heights Campus, Page’s primary client was the Fireman’s Fund. He designed subsequent additions to the site in the mid-1960s, as well as branch offices throughout California and consulted on other company outposts throughout the country. In 1985, the site became the UCSF Laurel Heights campus. Recently, the State Historical Resources Commission voted unanimously to list the property on the National Register of Historic Places and has forwarded the nomination to the National Park Service for concurrence. A pending development project has been proposed at the site, 3333 California Street, to accommodate new housing and retail space. The project has members of the Laurel Heights Neighborhood Association concerned about traffic, parking and the impact on historic resources at the site. While the proposed project would retain a portion of Page’s original office building, it would also insert a dense collection of new buildings, altering the relationship of buildings to landscape and garden. Special thanks to historians Michael Corbett and Denise Bradley, whose National Register nomination greatly informed this article.